The return value of the code (i.e., the result you would get if you were to pass the code to new Function and call the result) is a function taking a single numerical variable x and returning a single numerical result. 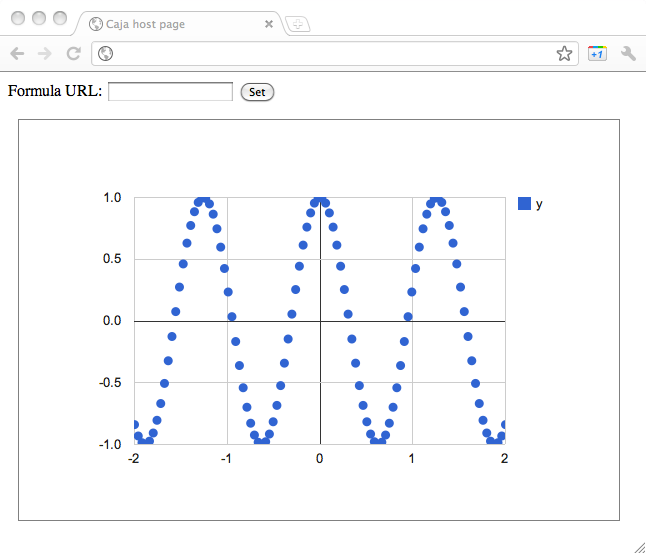 (2) We load the Google Charts API. We will get a callback at (9) when this API is ready. (4) This function creates and populates a Google Charts chart, again given some arbitrary numerical function f of one variable. It uses the function series at (3). Because this function was constructed by the guest code and could misbehave in various ways, we pass it to frame.untame (the opposite of the tame operation used in the preceding example Providing services to guest code) at (8) to obtain a better-behaved wrapper function (which, most significantly, will always frame.tame its arguments before passing them into the underlying guest code). However, we still must consider misbehavior such as, in this case of graphing, returning a value that isn't a number or even a string. Caja can't help us directly here since this is application-specific, so we do it ourselves; at (9) we make our own wrapper function which uses the unary + operator to ensure that the return value is a number before passing it to draw. We could also have put the + inside of draw. (10) When the Chart Tools API is ready, we add an onclick handler to the HTML button. You learned to obtain and use the return value from the guest code.